Connect students with science and enhance your field trip to Adventure Aquarium with an engaging education program. The Center for Aquatic Sciences at Adventure Aquarium offers programs that inspire future conservationists while supporting your curriculum. To book a program for your class at the aquarium, call 800-616-JAWS (5297). We are happy to collaborate with you on a custom program tailored to suit your students' needs. Contact us at learning@aquaticsciences.org or 856.361.1023 with questions or to arrange for a custom program. Sea Story – “I Went to the Beach…” is an original story about a little boy’s trip to the seashore, and the animals he meets there (fish, turtles, crabs, etc.). In this interactive program, young students will be able to touch stuffed animals like the sea creatures mentioned in the book, and finally meet a live sea animal that they may touch (optional). Sea Senses – This program encourages students to engage their senses to explore the world around them, and them compare and contrast their senses to 5 different sea animals. Students will answer questions such as “How can our sense of smell warn us about danger?” and “Does a penguin like the taste of candy?”. Fabulous Fish - Become a “fish detective” and investigate what makes a fish a fish. Students will learn criteria for determining if an animal is a fish or not, then apply those criteria to several different animals. In this very interactive program, students will be encouraged to make hypothesis and touch bio-facts from many different animals. Animal Wrappers - Examine the diversity of feathers, scales, and fur across the animal kingdom with many touchable artifact examples. Students will get a feel for the different types of skin that water animals have for camouflage, waterproofing, and predator-protection. Penguin Fun - Dive deeper into the world of penguins, exploring their feathers, food, and families! Penguins are unique birds with awesome adaptations! This program explores penguin predators and prey, penguin species, and penguin habitats. Get to know more about the world of penguins, with special emphasis on the species fund at Adventure Aquarium (African Blackfoot and Little Blue). Please Note: This program does NOT include a live penguin. What's Your Habitat? - Survey the diversity of animal homes around the world by meeting live animal ambassadors and learning why their homes suit them perfectly. Students may meet lizards, turtles, invertebrates, or fish (animal availability varies). Habitats such as wetlands, rainforests, deserts, and beaches will covered. Life On The Reef - Explore the colorful world of corals, and the relationships between animals that call the reef home. This program dives deep to answer questions such as, “What is a coral reef, anyway?”, “Why aren’t there reefs in New Jersey?”, and “How do animals cooperate to survive on the reef?”. Sea STEM Lab – Ocean Deep - This hands-on learning lab takes students on a voyage through the ocean’s layers to discover their properties and the animals who live there. In each ocean layer (Sunlight Zone, Twilight Zone, Midnight Zone, Abyssal Zone) this program details the conditions, animal life, and human efforts at ocean exploration. Students will each create their own ocean depth illustration, complete with appropriate sea creatures. Food Web – It’s a feeding frenzy! Students will work as a group to construct a “food web”, showing the relationships between predator and prey. Students will meet a carnivore and an herbivore (live animals). This program emphasizes the interconnectedness of all of the animals in an ecosystem. Endangered At Adventure - Learn about the ways in which animals become endangered, and how Adventure Aquarium cares for their most endangered animal ambassadors. This program gives students special insight into the exhibits at Adventure Aquarium, which they can use to identify endangered animals throughout their visit. Sharks! – Sharks are one of the coolest and most misunderstood animals on the planet. Demystify the biology of shark teeth, shark species, and shark behavior. Sea STEM Lab – Ocean Pollution - In this learning lab, students will become “ocean engineers” to investigate the causes and consequences of ocean pollution. Students will create a simulated oil spill, and experience the challenges of pollution cleanup. In this hands-on lab, students will get their hands dirty as they test various real-world methods of oil cleanup in their simulated ocean lab. Investigating Invertebrates – The ocean is full of spineless wonders! In this program, students will engage with live animals as well as animal artifacts to learn about the adaptations that animals without bones use to survive in the seas. We’ll discuss jellyfish defenses, how seastars keep their distinctive shape, and octopus intelligence. Built For Change - Meet live animal ambassadors, and compare and contrast the adaptations they use to thrive in their habitats. Adaptations include camouflage, hibernation, tooth shape, and feathers. Animals may vary, but will include reptiles, birds, and invertebrates. Shark Attack - Examine the forensics of shark attacks in order to separate the truth from media hype in this data-driven program. Is it safe to go to the beach this summer? How accurate was Jaws? What can you do to decrease the chance of a shark attack? Sea STEM Lab – Penguin Behavior - In this hands-on learning lab, students will be introduced to scientific behavior recording and analysis. Students will learn about penguin keeping and develop their own behavior log. Topics such as feeding, training, and enrichment will be covered, as students get a glimpse into the life of a penguin keeper here at Adventure Aquarium. Please Note: This program does NOT include a live penguin. Aquarium Careers - Learn about the many STEM careers available at an aquarium, and the day-to-day routines and qualifications necessary to work with sharks, penguins, and turtles. This program illuminates the ins and outs of a keeper’s daily schedule, the qualifications necessary to become a keeper, and the skills that are useful in this exciting field. For students seriously considering an aquarium career, we offer an in-depth, small group High School Shadow Program. The program is billed separately, and is available only on specific dates. The High School Shadow Program must be scheduled by the individual student. Inquire online at http://www.aquaticsciences.org/education/Shadow.html. Shark Conservation – This program encourages future shark advocates to consider the many complex threats to shark populations, and learn why it is important for humans to preserve this ancient predator. Students will examine the relationship that sharks have with humans, with both its benefits and hazards. With a focus on shark ecology, this program stresses the ways in which sharks keep the ocean healthy, and practical things that students can do to preserve shark species. Horseshoe Crab Ecology - Discover the superstar of New Jersey beach ecology, the horseshoe crab! In the Delaware Bay area, we are uniquely positioned to observe and protect this ancient species. Most people have seen a horseshoe crab on a beach vacation, but their importance to the global ecosystem often goes unappreciated. This program includes ecology, anatomy, and conservation topics. 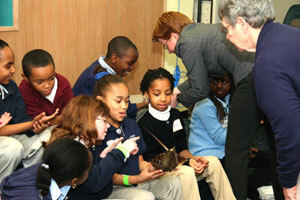 Students will see and touch a live horseshoe crab. Sea STEM Lab – Aquarium Water Quality - In this hands-on learning lab, students will test water using equipment and chemical processes used by biologists every day at the aquarium. Students will gain insight into aquarium systems, and why tests like ph, salinity, and nitrate levels are essential to animal health. After the hands-on tests are completed, students will problem-solve to determine which exhibits their water samples came from. Classes move at a pace appropriate to students' curiosity and attempt to accommodate multiple learning styles. I Am a Seastar - Engage your senses and discover aquatic animals through imitation, vocalization and movement, with plenty of sensory opportunities including animal artifacts. Students will be invited to bark like a seal, move their bodies like a seastar, and try on a turtle shell. Information and stories about these animals will be presented as students touch feathers, teeth, and shells. This program is for students who would prefer a less-structured, more imaginative animal lesson. Terrific Turtles - Meet several live turtles while learning about turtle and tortoise behavior, food and habitats. This program focuses on sea turtles, terrapins, and tortoises. While the live turtles are not touchable, turtle bio-facts such as shells will be available for students to touch. This structured program is for students interested in exploring a topic in depth. Conservation Champions (Grades 1st – 4th) - Meet some of our live animal ambassadors, discover the threats they face, and the ways students can protect them and their habitats. Animals such as turtles, birds, and invertebrates will be presented live. Students will be able to touch one of the animals at the conclusion of the program. Sharks: Truth Or Fiction (Grades 5th – 8th) - Test your knowledge of shark biology and behavior in this interactive program that dispels common movie myths about sharks. Are all sharks dangerous? Is there a vegetarian shark? Why do shark bite surfers? We’ll answer all these questions and more during Sharks: Truth or Fiction! Ocean Realm Tour, Sea Turtle Edition (Grades 3rd and up) - This 30-minute tour focuses on sea turtle biology and conservation. Students will learn about Adventure Aquarium’s sea turtle rescue and rehabilitation program. Students will go behind the scenes of the Ocean Realm exhibit for a bird’s eye view of Adventure Aquarium’s resident sea turtles, sharks, and rays. Upgrade to a 60-minute premium program. Please Note: Premium Programs are NOT included in package pricing. Please contact 800.616.JAWS (5297) for more information. Behind the Scenes Tour (Grades 5th and up) - This 60-minute tour takes you behind the scenes for an in-depth look at the facilities and people that keep Adventure Aquarium running smoothly. The tour visits the Water Quality Lab, Food Prep Kitchen, freezers, and Fish Holding area. The tour concludes at the top of the Ocean Realm exhibit, where students will get a bird’s eye view of sea turtles, sharks, and rays. Squid Dissection (Grades 6th and up) - This 60-minute program investigates the fascinating biology of octopus, squid and cuttlefish. The dissection portion of the program (fresh squid dissection) can be done as a hands-on team activity or as a demonstration. Students choosing the hands-on dissection will work in pairs or teams, noting the squid’s unique adaptations as they create a diagram of their dissected squid. Note: this program uses fresh, not preserved squid.